Many people desperately want to start a garden but find themselves constantly failing to keep their plants healthy and thriving. While gardening can be complicated and is certainly affected by all the conditions around you like weather, sunshine, rainfall, pollution, and more, one secret weapon that many gardening beginners don’t know about is mulch. It might seem simple, but mulch can be the difference between a lush, thriving garden and a barren, struggling one. Mulch brings a myriad of benefits along with it. Good quality mulch helps insulate your plant’s roots against drastic temperature changes, so they won’t be as affected by cold snaps or super-hot days. It also helps the soil retain moisture for longer, which means you won’t have to water as often, and your plants will get a slow, steady release of water. When it rains, mulch helps keep the soil underneath loose and uncompacted so that your plants’ roots can get all the nutrients in the soil. And best of all, mulch gives your garden a polished look. Organic mulch is made out of things like shredded bark, compost, grass clippings, and pine straw. Organic mulch breaks down over time and can help feed organic matter to your plants. Pete Rose mulch is of the highest caliber and costs less than mulch at big box stores. The Pete Rose mulch experts can help guide you toward the right mulch for your needs, whether you want color-enhanced mulch, double shredded mulch, or mulch that’s safer for your kids and pets to play in. When you walk away with Pete Rose mulch, you can feel good knowing you got a good deal on high-quality mulch that will help your garden thrive. You can apply mulch to your garden pretty much any time of year, even during the depths of winter or summer. How much mulch you should use depends on your soil type. 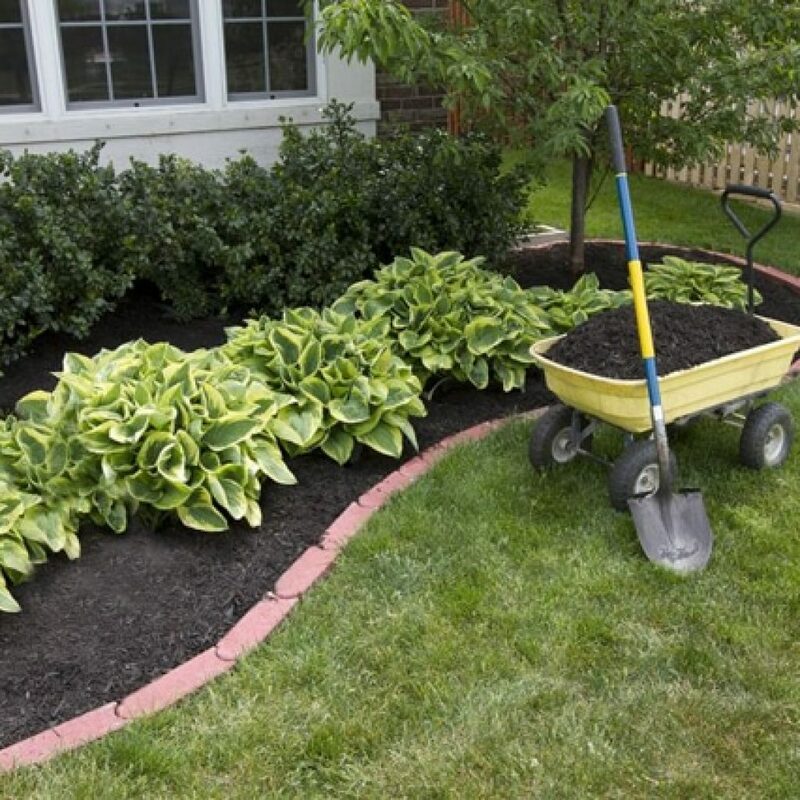 For average soil, you should apply about two to three inches of mulch. If you’re dealing with slower draining soil, you’re only going to want to use one to two inches. For fast draining soil – like sandy soil – use a little bit more mulch to help retain the water, about four inches. Make sure your mulch bed extends at least a few inches past the drip line of your plants, which is the outermost point that your plants’ leaves extend. If your plants aren’t full grown, make sure to add a generous cushion so that the drip line never extends past the mulch. It’s also recommended that you water your garden immediately after putting down your mulch. This helps anchor it down so that it doesn’t blow away in the wind and prevents the dry mulch from leeching too much water from the surrounding soil and drying out your plants’ roots.